Professional psychology is failing the family courts. A child’s rejection of a parent surrounding divorce is a family therapy issue, not a child custody issue. The family’s successful transition to a healthy and functional separated family structure following divorce is always in the child’s best interests. Divorce ends the marriage, not the family. A cutoff family structure is always pathological. A cutoff family structure is NEVER a healthy post-divorce family. It is always in the child’s best interests for the family to transition to a healthy and functional separated family structure following divorce. The courtroom is not the proper venue to solve family pathology. Family pathology cannot be litigated. The resolution of family pathology is the domain of professional psychology. The legal system therefore turns to professional psychology for consultation on family pathology. This request for consultation takes one of two forms, an order for something called “reunification therapy” or an order for a child custody evaluation by professional psychology. In each of these, professional psychology is failing the court. There, is that clear enough? If any mental health professional disagrees, there is a Comment section to this blog. Cite for me a single book or article that describes what “reunification therapy” is. 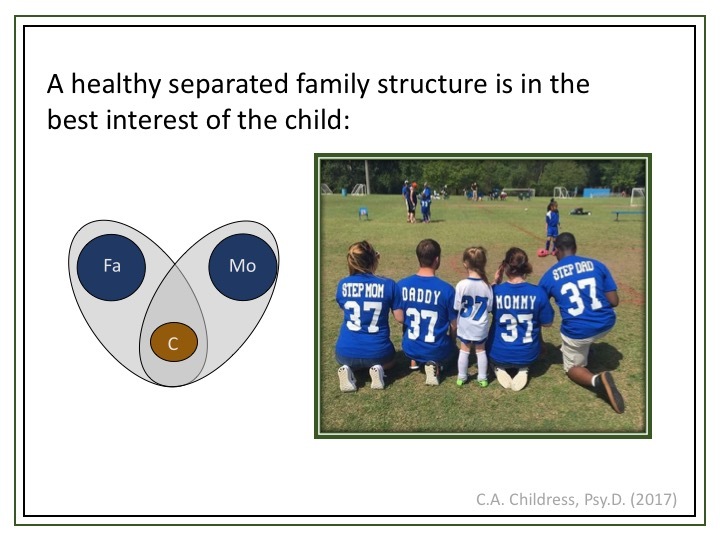 What the court and all parents want is family systems therapy; either Structural family systems (Minuchin) or Strategic family systems (Haley; Madanes). Bowen has a foundational family systems model (Bowenian family systems therapy; The Bowen Center). Satir has a model strong on family communication dynamics. A competent family systems therapist is knowledgeable about all of these variations. They all center around the same basic core constructs of Bowen; elaborated by Munichin and Haley. Family systems therapy is one of the four primary schools of psychotherapy, the others are psychoanalytic psychotherapy (think Freud and his couch), cognitive-behavioral therapy (think lab rats pressing a lever), and humanistic-existential psychotherapy (think hot tub in Esalen). Family systems therapy is the only school of psychotherapy that is designed to address and solve current family relationship conflict. Family systems therapy is the appropriate form of psychotherapy for addressing and resolving family-related conflict surrounding divorce. The pathology of a child-rejecting a parent surrounding divorce is called an “emotional cutoff” (Bowen). This is not Dr. Childress saying this. This is Murray Bowen saying this. Standard family systems construct. This is not Dr. Childress. This is Bowen. Standard family systems therapy. 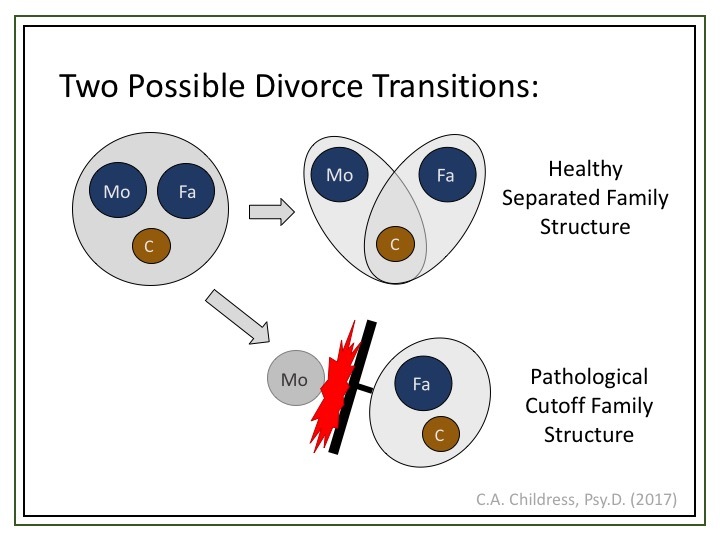 Disturbances in differentiation within family members can lead to the child’s “triangulation” into the spousal conflict to stabilize a parent’s vulnerability. The child’s “triangulation” into the spousal conflict can take the form of a “cross-generational coalition” with one parent against the other parent, resulting in an “emotional cutoff” in the child’s relationship with the targeted parent. All standard family systems therapy stuff. Bowen, Minuchin, Haley. There is no such thing as “reunification therapy.” No book. No article. No theorist. The court and parents want family systems therapy. Problem 1: Professional psychology is failing to provide the court with the proper professional knowledge and expertise needed to solve attachment-related family pathology surrounding divorce. 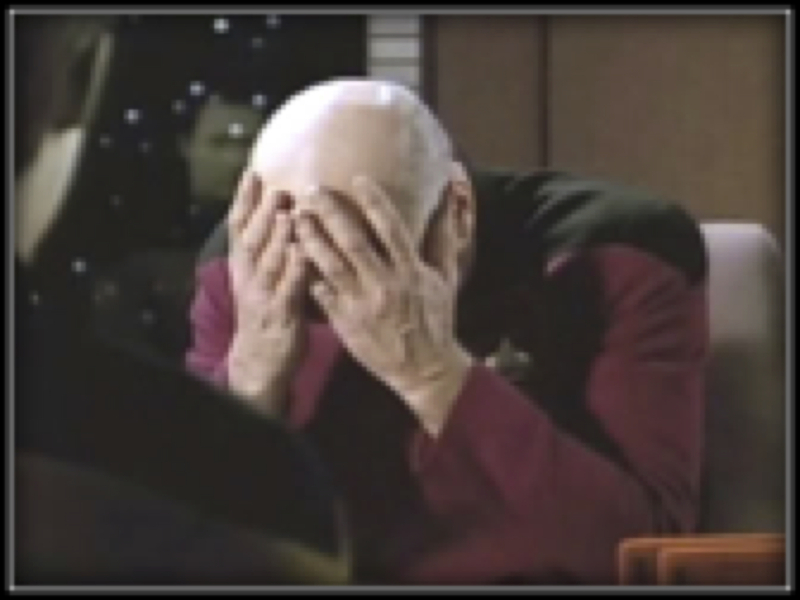 Instead, mental health persons surrounding the legal system are simply making stuff up willy nilly. Problem 2: Child custody evaluations. This is important to understand: There is no scientifically established support for the validity of child custody evaluations. There are multiple-multiple devastating problems with the practice of child custody evaluations, but I’ll focus here on just one, the most devastating one: No inter-rater reliability. The conclusions and recommendations reached by child custody evaluations have no inter-rater reliability. What this sentence means is that two different evaluators can reach two entirely different sets of conclusions and recommendations based on exactly the same data. Well, that’s a problem. According to the axioms of assessment, if an assessment procedure is not reliable (does not produce stable results), then the assessment procedure CANNOT – by definition – be valid. The conclusions and recommendations from child custody evaluations are not valid. If there is no inter-rater reliability, the conclusions and recommendations of child custody evaluations are simply the opinions of one person, that specific evaluator, perhaps based loosely on some psychological principles, perhaps based on no psychological principles whatsoever, just a matter of the individual opinion of the evaluator. Don’t believe me? There is a Comment section to this blog. I challenge any mental health professional to cite for me a single study indicating the inter-rater reliability of the conclusions and recommendations reached by child custody evaluations. The conclusions and recommendations of child custody evaluations are no more valid than a monkey throwing darts at a dart board, and a lot less entertaining – and, I might add, far more expensive. Child custody evaluations are a very lucrative industry for professional psychology surrounding the family courts. And do you know what the “reunification therapist” is going to say? It is the responsibility of professional psychology to treat and resolve family pathology. That’s our job. Professional psychology is failing the family court system. Professional psychology is not providing the court with the proper professional expertise required to solve the family conflict. The court and parents don’t want or need a pointless child custody evaluation. If you’re tempted to conduct a child custody evaluation I suggest you hire a monkey with darts instead; it’ll be more entertaining and equally as valid. The court and parents don’t want a mythical “reunification therapy,” a snake-oil therapy that solves nothing, ever. The court and parents want family systems therapy – real psychotherapy that will solve the family conflict and facilitate the family’s successful transition to a healthy and functional separated family structure following divorce, which is always in the child’s best interests. It is time for professional competence based in the standard and established constructs and principles of professional psychology. Family systems therapy: Bowen, Minuchin, Haley. The finger that points at the moon is not the moon.